Scientists have used hair to locate where distinct Aboriginal groups lived in Australia up to 50,000 years ago. 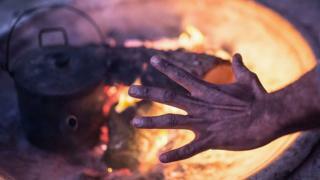 The genetic study could help reconnect indigenous families with ancestral communities, according to the University of Adelaide-led study. It shows the first Australians spread rapidly before largely spending continuous time in distinct areas. The research is an important step in learning more about ancestry prior to European settlement, the authors said. It again confirmed that Aboriginal Australians descended from a single population that arrived 50,000 years ago from New Guinea, when it was joined to Australia. The research, published in the journal Nature, analysed 111 hair samples taken by anthropologists from across Australia in the early 20th Century. The DNA allowed researchers to trace maternal ancestry through unique genetic material. "What we've found is that we can see right the way back to the first colonisation of Australia by Aboriginal people," said lead author Prof Alan Cooper. The first population spread rapidly. Within 2,000 years people had circled the east and west coasts before meeting somewhere in South Australia, the study said. "The amazing bit is that they don't seem to move again once they've done that," Prof Cooper said. "There's small movements into the desert interior but that basic pattern has held for 50,000 years." The findings offered another compelling reason for the strong indigenous connection to the land, he said. One of the study's co-authors, geneticist Dr Ray Tobler, said he traced his own family history to a small Queensland settlement. "My great-grandmother worked in the area around Cherbourg," he told the BBC, referring to area 260km (160 miles) north of Brisbane. "My grandad was born not too far from there." His grandfather never spoke about his heritage because, like more than 100,000 Aboriginal children, he was forcibly removed from his family at a young age. "This project can help provide lost history to some families," Dr Tobler said.